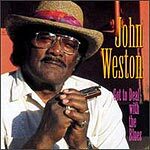 CD review: "Got to Deal With the Blues"
When Peter Lee quit as editor of Living Blues magazine and founded Fat Possum Records, one of the first artists he recorded was John Weston. Lee soon removed himself from the Fat Possum organization, but he's back now with Midnight Creeper Records  and again, harpist/singer Weston is one of his first acts. Weston hails from the Mississippi Delta  one of the original and most influential birthplaces of the blues, where folks like Muddy Waters and B.B. King came from. Home of the famed crossroads and Robert Johnson. There's still blues in the Delta, still a blues that has a young black audience, too, and Weston's juke-joint version of the music is from that school. While the image of the Delta is as a raw backwater, Weston shows a polished, modern touch on the blues. It's as much R&B as country, and Weston's smooth vocals would be just as at home in Memphis or L.A. as in Oxford, Miss. The backing band is competent, with guitarist Troy Broussard being outstanding. The songs  all written or co-written by Weston  are lilting, contemporary tales of lost love and betrayal. But it's when Weston plays chromatic harmonica that he best grabs your attention and ear. Usually associated with jazz and Brazilian music, the chromatic harp has a richer, more complex sound than the diatonic generally identified with the blues. But with Weston, it works  and works well.